A stack of 1000 Nigerian Naira. 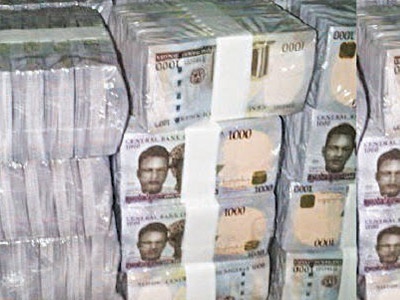 The senate revealed that it has had recovered N140 billion, while the Central Bank of Nigeria has confirmed receipt of N128 billion. The Nigerian senate says it will make public names of companies found guilty of alleged N30 trillion revenue scam in the import and export value chain. The senate said it has completed the first batch of investigation of 60 companies and their identities would be revealed for causing revenue loss to the government. Chairman of the Joint Committee on Customs, Excise and Tariff and Marine Transport, Sen. Hope Uzodinma said the names to be published would contain details of how much of recoverable government revenue was with each of the companies. Uzodinma explained that those bothering on smuggling and import infractions would be referred to the Nigeria Customs Service for recovery of such revenues and possibly blacklisting. He said after the names are published, they will be handed over to the EFCC and Customs for prosecution. Uzodinma added that the reason for the delay is to be sure that the listed companies are truly culpable. It could be recalled that the joint committee was mandated by the Senate to carry out investigation into alleged N30 trillion revenue leakages in foreign exchange and the entire import and export value chain between 2006 and 2017. Presenting an interim report to the senate on October 18, the Uzodinma-led committee revealed that it has had recovered N140 billion, while the Central Bank of Nigeria has confirmed receipt of N128 billion.